Zack Lieberman and Louis Neubert collaborate on the rollicking, thought-provoking tale of a boy and his dog, in the graphic novel Max & Charlie. Charlie, a young boy with a vivid imagination, finds himself searching for his dog in New York City, an effort that combines reality with fantasy, and often blurs the line between them. Neubert’s art is terrific, and the Day-Glo color palette he uses casts Manhattan in a kind of dreamy transcendence. Facial expressions are exaggerated with an expert eye, and the beginning sequence—Max and Charlie on a pretend space mission—recalls the work of Chuck Jones, Looney Tunes animator extraordinaire. Max & Charlie veers from one encounter to the next during Charlie’s search, most of which entertain, but following the storytelling can be tricky at times due to the heavy reliance on visuals. 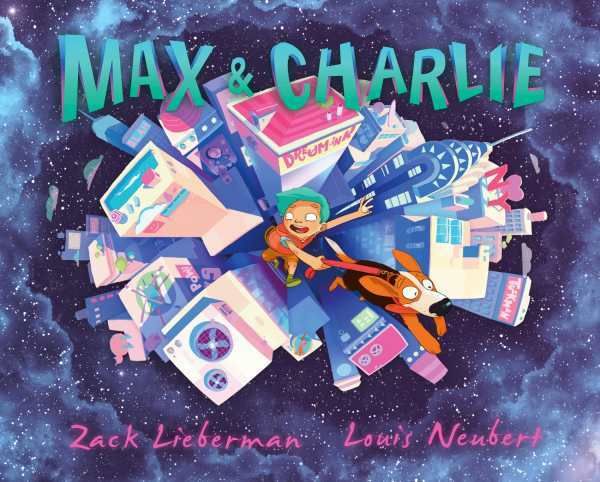 Lieberman has a background in film and digital art—Max & Charlie will also be available as an interactive e-book—so it’s understandable that images would take precedence, and the style helps to emphasize Charlie’s unique, child’s-eye point of view. Along his journey, Charlie meets many people who offer advice or veiled philosophy, including an old black man, a tattooed pedicab driver, and a pair of inept police officers, one of whom says to Charlie, “There’s a lesson in there somewhere, eh buddy?” There’s a definite sense that Lieberman is trying to make some larger impact than that of a simple boy-finds-dog story, and the pedicab driver might hit the nail on the head when he explains to Charlie that in this world, one needs to trust oneself: “Your eyes. Your mind. Your experience.” Experiences of reading Max & Charlie may vary, but the book stands apart as a distinctive labor of love.